Lyndon Henry is a transportation planning consultant and online writer for Railway Age magazine as well as writing/editing consultant. More and more people seem to be considering trying out Amtrak's rail passenger service for a fairly long trip — even if it takes substantially longer than air travel, and perhaps means riding the train overnight. Mainly in connection with my work in the public transportation field, I've probably been traveling Amtrak on long-distance routes more than the national average, and have some familiarity with the various available route options ... so I thought that sharing some information and suggestions might be helpful, particularly for prospective first-time Amtrak travelers. 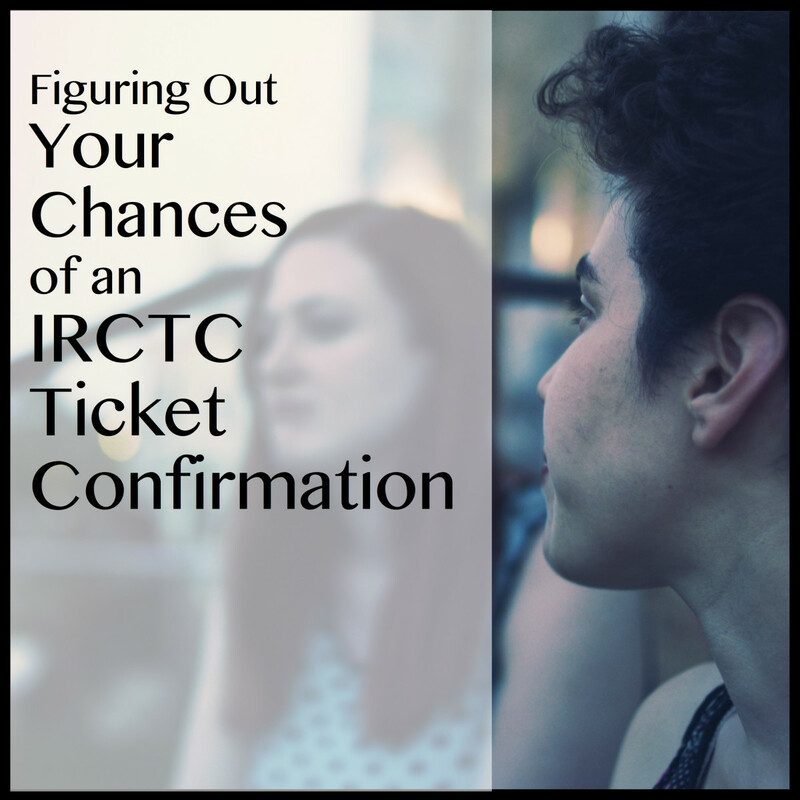 The first thing to understand is: You might not be able to get by Amtrak to where you want to go from where you are! Amtrak's route structure is extremely limited, having been amputated and snipped and truncated over the roughly 40 years since the agency was formed. As I've noted before, Washington traditionally treats Amtrak as the Oliver Twist of America's public transportation system. And that's not all: Quite a few otherwise desirable travel routes are simply impossible — if you want to travel by Amtrak to Florida from the West Coast, Southwest, or Middle West, you have to go by way of Chicago and Washington, DC! Even cities served directly by Amtrak's rail system may be out of reach: A traveler from here in Texas could not feasibly catch an Amtrak train to Denver, Salt Lake City, Memphis, Atlanta, Birmingham, Jacksonville, Orlando, Tampa, or Miami! The good news is that if you can select an Amtrak route that will work for you, carrying you from where you are (or nearby) to another city you'd like to visit, you'll probably have an amazingly enjoyable trip. You won't be stuck in the middle of a freeway. You won't be looking down at the tops of clouds or the indiscernible patterns of hazy landscape from 30,000 feet. 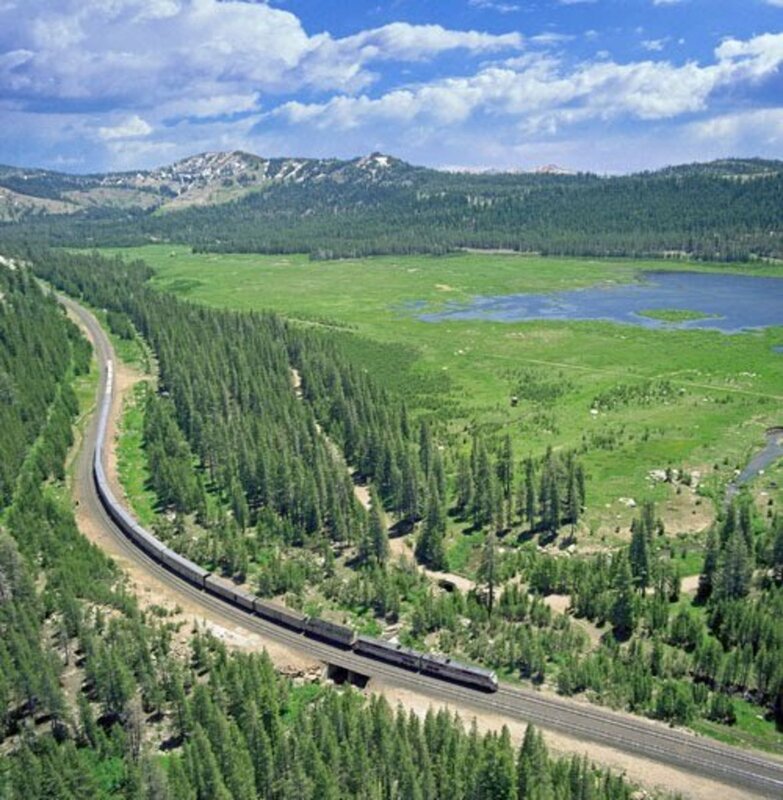 From a train, you'll get a panoramic view of the land around you, a unique perspective of the American countryside as you roll through it. One note: Amtrak's long-distance routes out West, plus the Capitol Limited (Chicago-Washington) and City of New Orleans (Chicago-New Orleans), use double-deck Superliner rolling stock, cars that provide more restroom facilities and are somewhat more spacious than the single-level Viewliner (sleeper) and Amfleet II (coach) equipment used on the vast majority of the routes in the East (including those connecting the Northeast to Florida). I've always found the Superliners considerably more comfortable. I've included more information on which Amtrak long-distance routes operate which type of rolling stock, further below. Anyway, with that introduction, some suggestions are listed below. 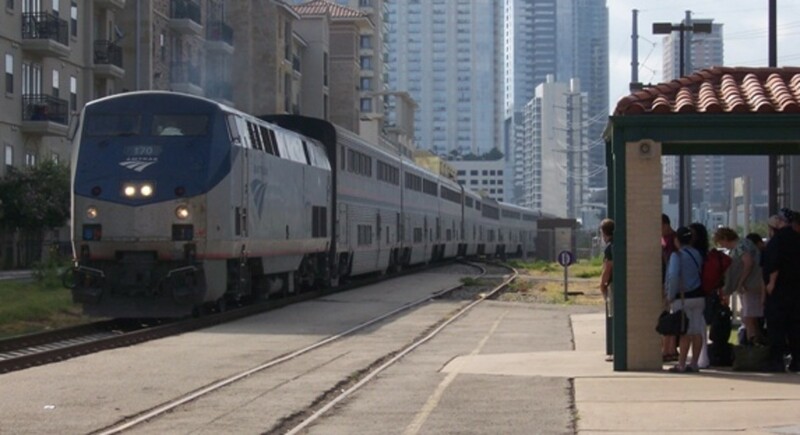 • Silver Star/Silver Meteor — A couple of long-distance routes worth considering between the Northeast and Florida are the Silver Star to Tampa and Miami and the Silver Meteor to Miami. (The Star also serves Raleigh, NC, while the Meteor also serves Charleston, SC.) In addition, both these routes serve Savannah, Jacksonville and Orlando (plus several other points). • Crescent — This train provides a particularly interesting journey connecting New Orleans with Birmingham, Atlanta, Charlotte, Washington, Baltimore, Philadelphia, and New York City, passing through portions of the Shenandoah National Park, the Blue Ridge Mountains, and various Civil War landscapes along the way. Etched in my memory is the gorgeous scenery through the hills of Alabama, but the really spectacular part is the ride across Lake Ponchartrain on the 6-mile-long narrow railroad causeway — with nothing but water on each side, you feel like you're riding on the water. Coming eastbound out of New Orleans in the early morning is the time to have breakfast in the diner, watching the sunrise over the lake. And does anyone really need an excuse to visit New Orleans? 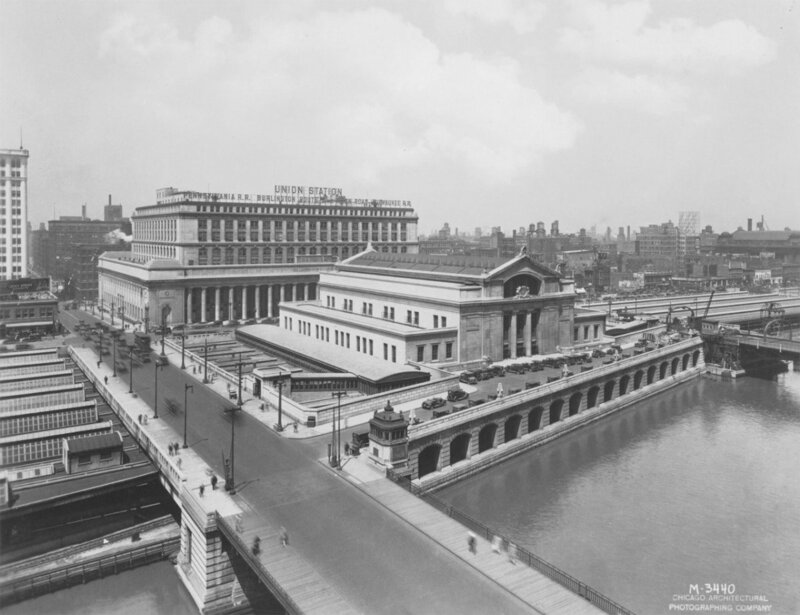 • Lake Shore Limited — Connecting Chicago with New York City by way of Toledo, Cleveland, Buffalo, and Albany, this route also has great scenery along the Hudson River north of NYC. Also there's a section that splits at Albany, linking with Boston. • Capitol Limited — This route connects Chicago with Toledo, Cleveland, Pittsburgh, and Washington. 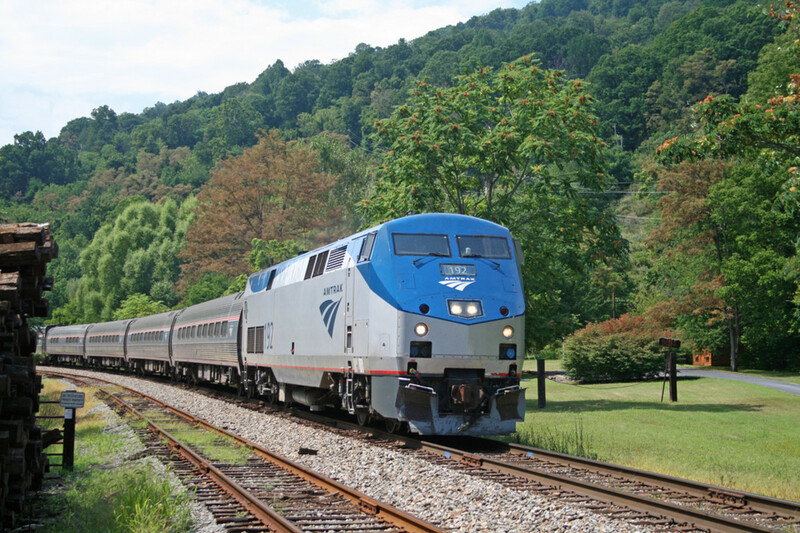 With Superliner cars, it's a more comfortable way to take a train from the East Coast to Chicago. 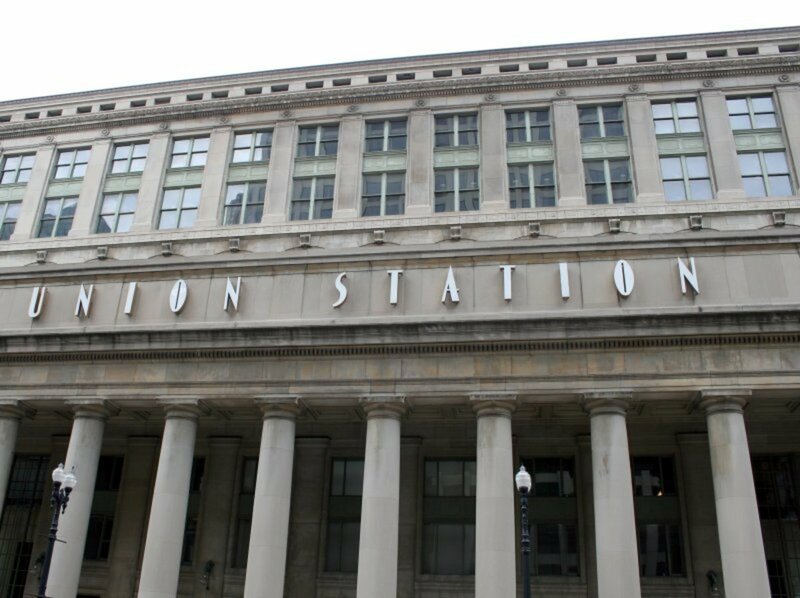 • City of New Orleans — Made famous, of course, by the Steve Goodman song, this train route connects Chicago with New Orleans, linking Memphis and Jackson (plus a number of smaller cities and towns) in between. Traversing much of the Mississippi River Basin, the City passes through central Illinois farmlands, Tennessee and Mississippi forests, and Louisiana bayous on its way to the Las Vegas of the South. 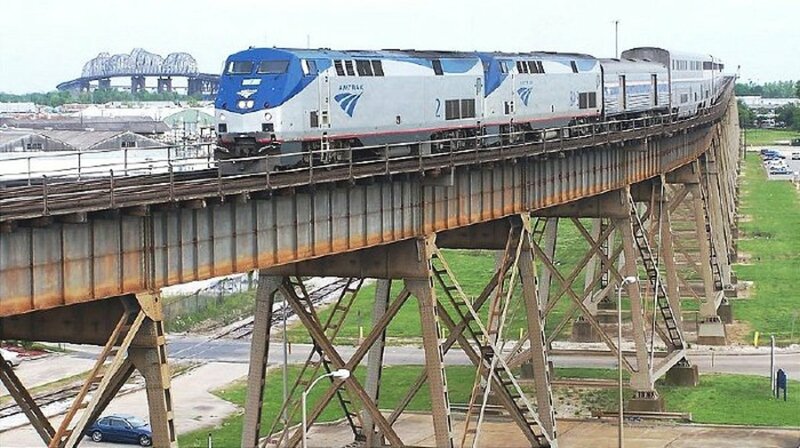 • Texas Eagle — Seven days a week, this train connects Chicago with San Antonio, serving St. Louis, Little Rock, Dallas, Ft. Worth, and Austin in between (plus a number of smaller cities and towns). Then, three days a week, the coach and sleeping cars are connected as a through section onto the east-west Sunset Limited between San Antonio-Los Angeles and back (discussed below). Between Chicago and San Antonio, the most spectacular scenic views, in my opinion, are the vista of the St. Louis Arch and crossing the Mississippi at St. Louis; the early-morning northbound ride along the Mississippi as you approach St. Louis from the south; and the piney woods of southwestern Arkansas and East Texas. Also, the view in Austin as you cross the Colorado River over the old single-track steel deck bridge is pretty impressive. 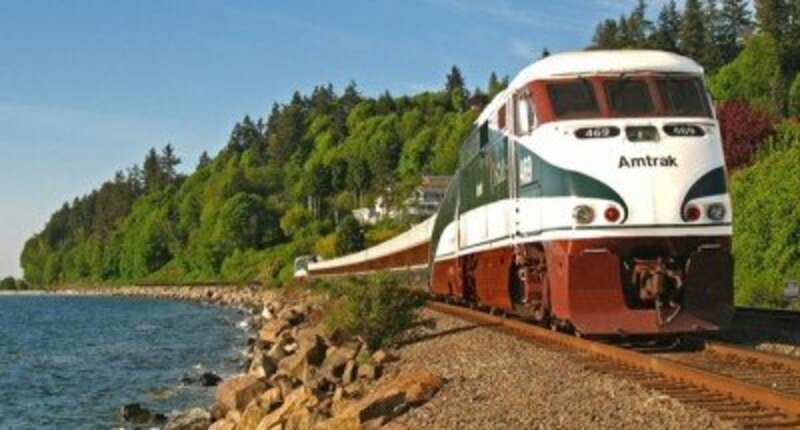 • Empire Builder — Connecting Chicago with Seattle (with a section between Spokane and Portland), this is one of Amtrak's premier trains, also linking Milwaukee, St. Paul/Minneapolis, Fargo, and Spokane, plus an array of other communities in between. I haven't ridden the Builder for many years, but the ride through the northern Rocky Mountains is unforgettable. On the way toward Spokane, you also ride through several Native American reservations, and the train makes four stops along the edge of Glacier National Park. While the main train proceeds on to Seattle, at Spokane the Portland section proceeds southwesterly past the confluence of the Snake and Yakima Rivers, then follows the Columbia River past Mount St. Helens and Mount Hood on into Portland. • California Zephyr — This is also one of Amtrak's absolutely most spectacular routes, connecting Chicago with San Francisco by way of Omaha, Denver, Salt Lake City, Reno, and Sacramento (and a bunch of smaller cities and communities), through some of the most beautiful terrain in the USA. This includes crossing the Rocky Mountains (Colorado), passing the edge of the Great Salt Lake in Utah,and climbing over the Sierra Nevada mountain range (California). Among an array of tunnels and bridges is the historic Moffatt Tunnel, over six miles long; you also go through the historic Donner Pass, site of the ill-fated Donner Party tragedy of the early 19th century (forever remembered in connection with their unfortunate choice of cuisine). Incidentally, the western terminus is in Emeryville, from which a short Thruway bus connector takes you across the bay into the waterfront station in downtown San Francisco. • Southwest Chief — This is the fastest of Amtrak's two routes linking Chicago with Los Angeles (the other is the Sunset Limited, discussed below). Following the historic Santa Fe Trail, and connecting Kansas City, Topeka, Albuquerque, Flagstaff, and San Bernardino (plus an assortment of smaller communities), the Chief passes Boot Hill in Dodge City, winds through a portion of the Rockies, then crosses the arid Arizona desert, and trundles on into Los Angeles via the San Gabriel Mountains and the Mojave Desert. When I rode this train, I caught it at Kansas City (rather late at night). I think I slept past Boot Hill, but I did find interesting the large brigade of arts & crafts vendors on the Albuquerque station platform — an excellent opportunity to buy presents for friends and loved ones at a bargain, plus a nice warm Navajo-style travel blanket that I still use. • Coast Starlight — Although this is another of Amtrak's premier trains, and one of its most scenic routes, it unfortunately has a less-than-sterling reputation for punctuality, as indicated by its moniker among railfans and savvy riders: the Starlate. Nevertheless, running along most of the West Coast, it traverses a diversity of gorgeous terrain and scenic views while connecting Los Angeles with San Jose, Oakland, Sacramento, Portland, Eugene, Tacoma, and the northern terminus, Seattle — plus the usual assortment of smaller cities and towns along the way, such as Burbank, Santa Barbara, Davis, Salem, and Olympia. It's also considered a kind of party train (particularly popular with the younger set). Some of the Starlight's most stunning scenery includes a stretch where the tracks run high above the Pacific Ocean coastline, providing superb views of beaches and surf in an area accessible only by train. Further north, you wind around some of the USA's highest mountains, mainly the Cascade chain (I recall waking up one morning with the volcanic Mt. Shasta rising in the dawn fog outside my window). Lots of tunnels here, as you proceed through the Twin Peaks country with its deep forests and pristine waterfalls, on along the Puget Sound coast past Tacoma and into Seattle. 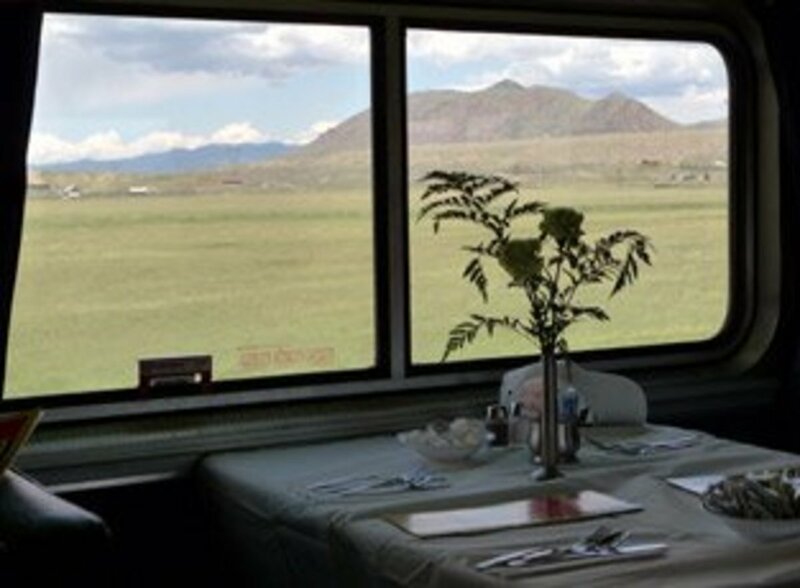 • Sunset Limited — An east-west train like the Empire Builder, the Sunset Limited follows a southern route through the Southwest to connect Los Angeles with New Orleans, linking Palm Springs, Tucson, El Paso, San Antonio, and Houston, plus a string of smaller cities and towns, along the way. (This is the train that manages to bypass Phoenix by about 30 miles.) Much of the route traverses very arid Southwestern desert country, including the Sonora Desert, punctuated by varieties of cactus, and accompanied by splendid views of high mesas and deep canyons (with an occasional river or creek crawling through them). Near San Bernardino, the Sunset skirts the edge of the curious Salton Sea, actually a massive semi-artificial lake dating from the early 20th century. Just west of El Paso, the route almost touches the Mexican border, across which I used to be able to see the impoverished colonias of Mexican workingclass families (today, the so-called Border Fence — actually a massive wall — may hide much of this). Just west of downtown El Paso, the train crawls across a spindly trestle over the Rio Grande; then, east of the central city, the tracks run in a subsurface alignment beneath the streets, both in tunnels and open cuts. After the sagebrush and mesquite prairies of West Texas, the Sunset gradually enters the more moist and verdant terrain of East Texas. Then, as it approaches New Orleans, the train provides an utterly stunning view of the Mississippi flood plain and river as it rises up above the wetlands and bayous over a 4.4-mile stretch of viaduct and the Huey P. Long Bridge, with white egrets and greyish-green alligators sometimes visible below, and eventually the wide brown expanse of the Mississippi. As you consider trip options and make plans, Amtrak's route maps may be helpful. There's an Interactive Route Atlas — just go to Amtrak's maps page and look for the link to this toward the top. There's also the option on that page of downloading a PDF of the national route map. What a wonderful travel article. Train is probably my favorite way to travel, but I haven't done much of it in the USA. I live in Tennessee and we have to travel a ways just to catch one of these trains. This country went through this wonderful expansion west when we built all of these train lines to connect our country, then along came big oil and put a damper on our train industry. 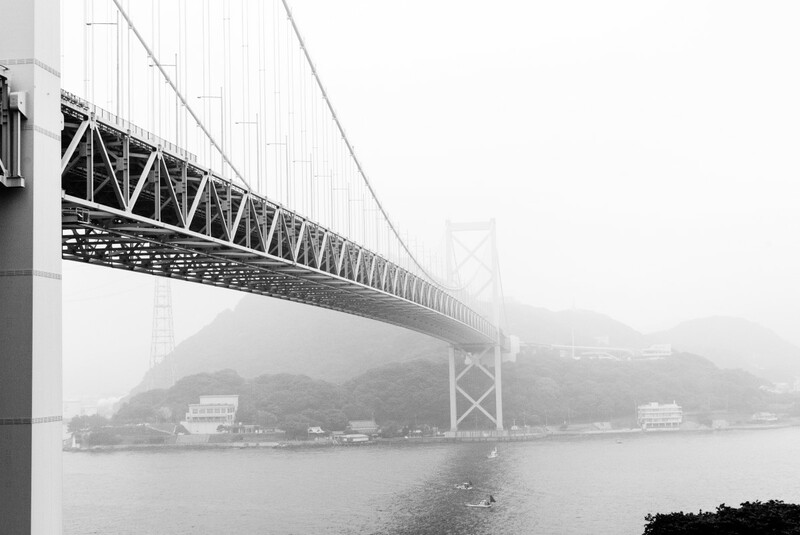 I would love to be able to travel in my own country by train more. We have been looking into doing a cross country amtrak tour. I am bookmarking this baby for further reference. Thanks!! !